I give up. My nagging of Big D to write a guest post here in my space and talk about some of the awesome meals he makes our family is over. I would love him to update here after he sees it and make fun of all the ‘mistakes’ I make in the ingredients and process. This is the best way I know of to goad him into talking food here. If he does, you will get a taste of his instinctive method of cooking. If he doesn’t take the bait, you still get a recipe from me that reflects a basic version of what we create, eat a lot of and enjoy. I spicing varies with every batch, but it is so easy to make a big pan of it and have it around for quick meals. 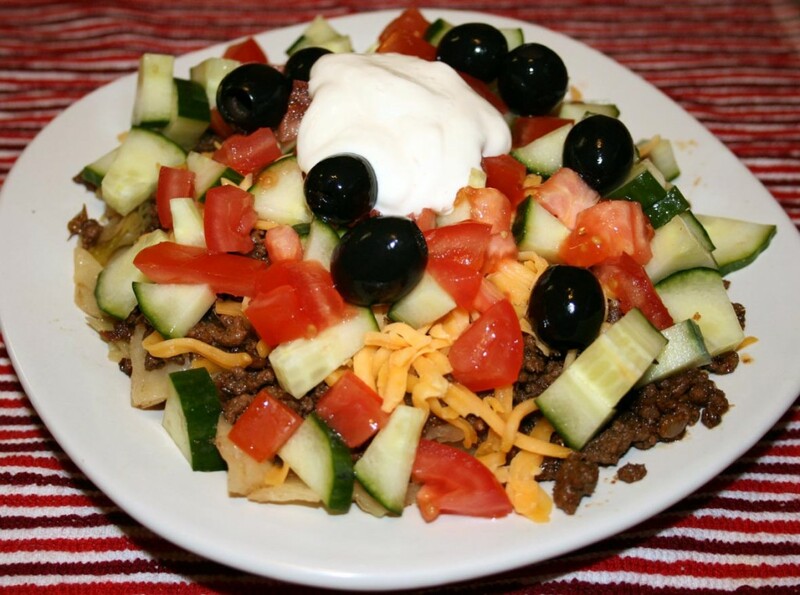 You can never go wrong using a package of ground beef with this recipe. It reminds me of Texas and the two week party in San Antonio called Fiesta! It happens every April, and seeing the pictures coming out of San Antone recently, along with the memories of partying it up myself when I lived down there, gave me a serious hankering for some good taco meat. Not what you get out of a prepackaged mix, or find in a school cafeteria, but the real taco meat I grew up with, as did Big D. We like it really spicy around here, and achieve an acceptable level of spice with the wonderful smokiness of chipotle peppers in adobo sauce. They are optional, of course, but add a level of flavor Big D and I have not found elsewhere. Big D often eats it simply as a pile of meat and cheese, occasionally with some vegetables underneath. You can see from the picture I often surround mine with sauteed veggies underneath (this time with cabbage) and top it with tomatoes, cucumber, olives and sour cream. If you look closely, you will actually see meat! The meat can of course also be served with tortillas, but we don’t keep such things around the house anymore. Take a siesta and enjoy! In a large skillet over high heat add grease. When it is hot add the cumin seeds, red pepper flakes and optional chipotle peppers. Stir frequently until they begin to darken. After a few minutes add the garlic, chili powder, cayenne pepper, cumin powder and optional adobo sauce. Stir for about a minute until it too darkens. Add the onion and cook until the onions begin to sweat and brown. Add the ground beef, breaking it up into small pieces while also combining it with the onion and spice mixture. Add ½ tsp salt and continue stirring. When about half the liquid has reduced, about five to eight minutes, add the beer. Sip on the rest of the beer in the bottle. Continue cooking over high heat until the liquid reduces again. When most of the liquid is cooked off turn down to medium heat and continue cooking until most of the liquid is gone. The meat should begin searing. Drink some more beer. After searing the meat for about a minute turn down the heat to low and simmer. Taste and add more salt to preferred saltiness. Let sit with the heat off for about ten minutes before serving. Lessee…I like to put the red pepper flakes in early ’cause they get a roasted sort of flavor, and aren’t too hot (which lets me add more pepper later). The cumin seeds do well when added early too, but I’d hold off on the chipotles if it were me. Actually the flavor from the pepper flakes is very similar to chipotle anyway, so…there’s room to play there. Of course I just dump everything in without measuring. Because that’s how it’s done. I use the whole freakin’ beer. Mostly. For what it’s worth, I like to use Mexican beers…but truthfully the main thing is that darker beers add more flavor. I’m an IPA kind of guy these days, but I’d much rather use a Guinness Extra Stout (because the standard Guinness is sorta watery and if I have a Foreign Extra Stout I’m going to drink it myself). Lots of the flavor gets increased at the end, via the searing. Which is also frying actually…that liquid ain’t water nomore, nohow. So don’t skip the searing, and turning up the heat won’t hurt the flavor at all. Assuming you’re careful with the cilantro (see below), ’cause it can get crisped away to nothing if you let it. So, er…this is below, but not too far below. Nonetheless, onward: I like to add some cilantro when the searing is nearly done. There, I said it. The final touch for me is to squirt some lime juice and sprinkle a little more comino (cumin, for people who didn’t grow up in San Antonio) in with it all. You can’t ever have too much comino. Or garlic either. In fact those are good general guidelines for life. Aren’t they? When I’m doing it, the salt’s generally already there by the end. But yeah, if it ain’t, it needs to be added. This stuff is supposed to be salty and good, not politically correct! Final tip: of course taco meat typically gets served with cheese. And it should be hot enough to melt the cheese. But sometimes a guest will eat our food in a non-recommended way. In resigned preparation for their outlandish and ill-considered behavior, I often melt some cheese into the meat about the same time I add cilantro. It makes a difference. Though proper guest-training should of course make this step unnecessary. Oh wow. I didn’t read your ingredients carefully. Now I have! I must comment again! I’ve NEVER used cayenne pepper in taco meat. That’s just…wrong. No matter how many times it gets used and tastes great. It’s still wrong damnit. And I nearly ALWAYS add jalapenos if I can get them. Number and chunk size to be determined by the guests present and how I want them to react. Much variation is possible here. I also like to buy lots of separate dried peppers and combine ’em according to my mood. But still. No cayenne. Though actually MA’s version was tasty too. If that sort of thing matters to you. Aha! I KNEW I would be able to pull you in! And yes, your adjustments make the meat taste delish. My version is definitely something that can made if one has a limited seasoning pantry. I don’t know that any two batches we have made over the years were exactly the same. Kinda like snowflakes! Meat snowflakes!